It's hard to believe it's September and now that the last hoorah of summer (aka Labor Day) is officially over. And now that Labor Day is officially over, it's officially time to start thinking about the impending fall season. I woke up this morning after extensive Labor Day lake time this past weekend and was met with tons of rain and lightening...and coldness. Yikes. I didn't think the transition from summer to fall would happen so quickly, but hey, let's embrace it. Last year I started doing little seasonal "to-do lists" of things I want to do/document during each season. Fall is a favorite, because there's just so many festive things to do! It may be a bit early to think about purchasing a new sweater and carving pumpkins, but on the other end the PSL (pumpkin spice latte) is already available at Starbucks. If that doesn't scream 'fall,' I'm not sure what does. What's on your fall to do list? Let me know! Ah, Fall lists always make me so happy! 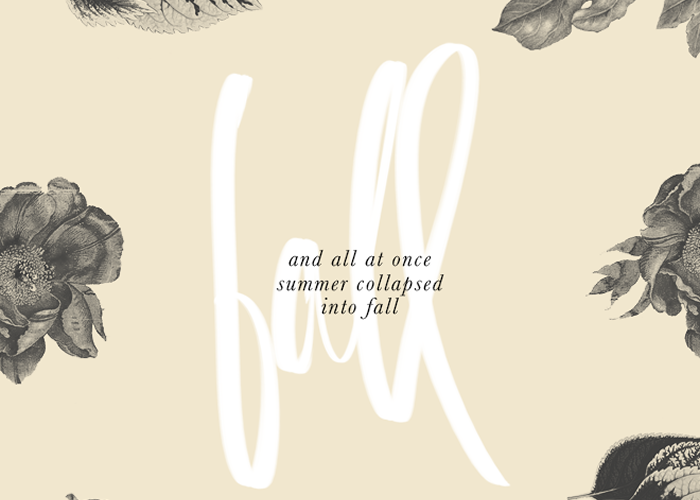 I love Fall, I wish I lived somewhere where we actually got Fall-like weather! Andrew and I go apple picking every year and it's my absolute favorite Fall activity! This just got me so excited for Fall. Also, why do I feel like you would make the greatest best friend ever? pumpkin spice latte's, haunted houses AND bonfires? Girl I like the way you think!